The infection is transmitted through contact with eye and nose discharge of infected people, particularly young children who harbour the principal reservoir of infection. It is also spread by flies which have been in contact with the eyes and noses of infected people. It is known to be a public health problem in 37 countries, and is responsible for the blindness or visual impairment of about 1.9 million people. Based on April 2018 data, 158 million people live in trachoma endemic areas and are at risk of trachoma blindness. Blindness from trachoma is irreversible. Infection spreads through personal contact (via hands, clothes or bedding) and by flies that have been in contact with discharge from the eyes or nose of an infected person. With repeated episodes of infection over many years, the eyelashes may be drawn in so that they rub on the surface of the eye, with pain and discomfort and permanent damage to the cornea. In areas where trachoma is endemic, active (inflammatory) trachoma is common among preschool-aged children, with prevalence rates which can be as high as 60–90%. Infection becomes less frequent and shorter in duration with increasing age. Infection is usually acquired when living in close proximity to others with active disease, and the family is the main setting for transmission. An individual’s immune system can clear a single episode of infection, but in endemic communities, re-acquisition of the organism occurs frequently. After years of repeated infection, the inside of the eyelid can become so severely scarred (trachomatous conjunctival scarring) that it turns inwards and causes the eyelashes to rub against the eyeball (trachomatous trichiasis), resulting in constant pain and light intolerance; this and other alterations of the eye can lead to scarring of the cornea. Left untreated, this condition leads to the formation of irreversible opacities, with resulting visual impairment or blindness. The age at which this occurs depends on several factors including local transmission intensity. In very highly endemic communities, it can occur in childhood, though onset of visual impairment between the ages of 30 and 40 years is more typical. 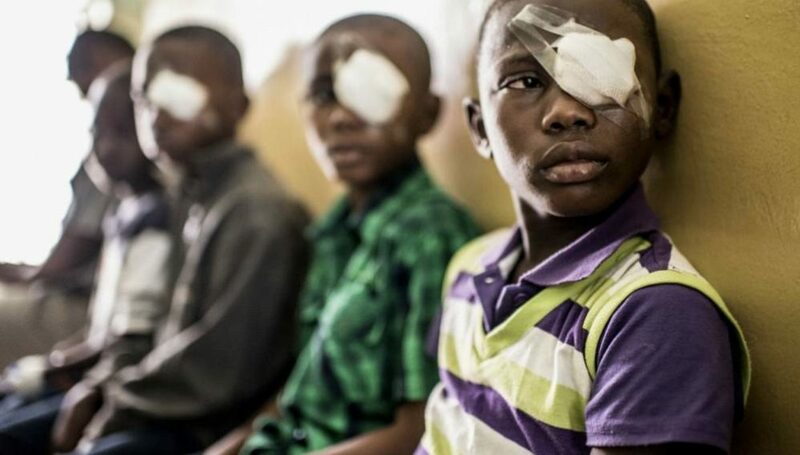 Visual impairment or blindness results in a worsening of the life experience of affected individuals and their families, who are normally already amongst the poorest of the poor. Women are blinded up to 4 times as often as men, probably due to their close contact with infected children and their resulting greater frequency of infection episodes. Environmental improvement, particularly improving access to water and sanitation.